Botrytis is one of those problems that can occur at any time conditions are right. There are some 50 species of the fungus Botrytis, but Botrytis cinerea has the largest host range. Botrytis is often referred to as gray mold because it produces a crop of fuzzy gray spores on the surface of infected tissues. Although Botrytis attacks plants and flowers at any stage, new tender growth and aging or dead tissues are preferred. Flowers petals provide an excellent food source for the production of spores. 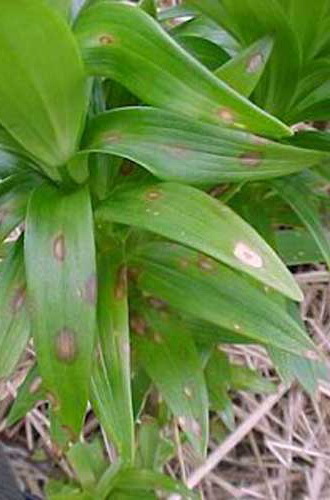 The fungus becomes established in flower petals and appears as irregular, enlarged, tan, water-soaked spots that eventually develop into soft fuzzy tissue. Aging flowers are particularly susceptible. 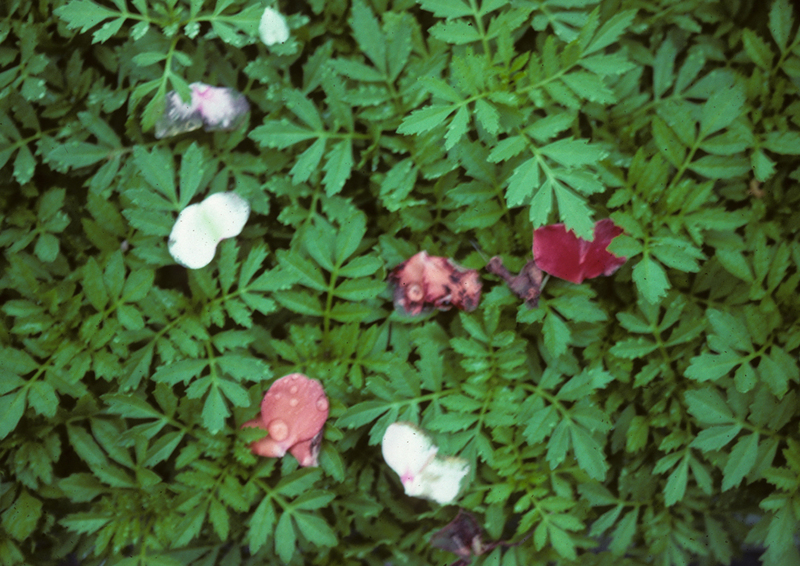 Petals of badly infected flowers stick together and become matted. During production, blossom and bud blight often precede and lead to infections on leaves and stems. These less obvious symptoms show as tan colored spots on leaves or cankers on stems that can eventually cause entire branches of plants to wilt, while the rest of the plant appears healthy. During storage and shipping, Botrytis causes blight or blast on leaf and flower buds. The fungus will also colonize dead or dying tissues anywhere conditions are right- in greenhouses, the field, packing sheds, coolers or during shipping. Prolonged periods of cool, cloudy weather create an ideal environment for Botryis infections during production in a full greenhouse or out in the field. Like other fungi, Botrytis has a range of temperature and relative humidity that is necessary for spore germination, infection, and disease development. Spore germination and infection depends on a film of moisture for 8 to 12 hours, relative humidity of 93% or greater, and temperatures between 55-65°F with colonization of plant tissues occurring at temperatures up to 70°F. Botrytis occurs most often in spring and fall, because warm days followed by cool evenings result in condensation on plant surfaces. 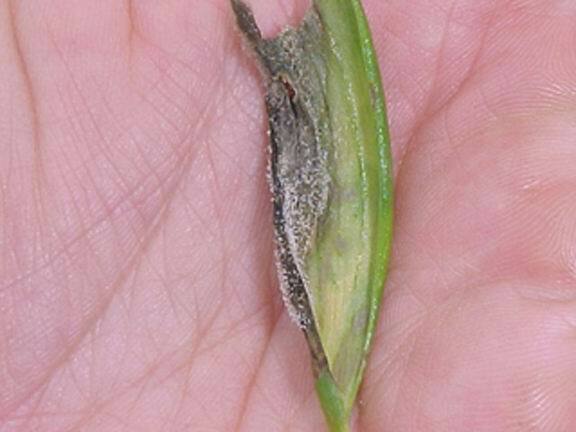 Once Botrytis develops, it cannot be effectively controlled with fungicides alone. The key to suppressing Botrytis is to keep the plant canopy dry especially from dusk until dawn. Using drip irrigation or watering plants at the base instead of sprinkling or watering overhead will help to prevent Botrytis and many other leaf spot diseases. Increasing plant spacing to provide a less dense canopy will also help by allowing more air circulation and better fungicide coverage. Water just enough to prevent excess water on the floor, and water early enough in the day to allow plant surfaces to dry before evening reduces humidity and will help manage Botrytis. During cool times of the year, when a greenhouse is being heated, another practice to reduce humidity is to use a combination of ventilation and heating. Ventilation allows the exchange of moist greenhouse air with drier air from outdoors. Heating is necessary to bring outdoor air up to optimum growing temperature, and increases the capacity of the air to carry moisture, thus avoiding condensation. Neither practice alone is as efficient as both combined. According to John Bartok, University of Connecticut Extension Professor-Emeritus, the method and time it takes for heating and venting will vary according to the heating and ventilation system in the greenhouse. John advises, in greenhouses with vents, the heat should be turned on and the vents cracked open an inch or so. When doing this the warmed air will hold more moisture and escape from the greenhouse through the vents which will be replaced with outside air of lower relative humidity. This natural rising of the air will result in a greenhouse of lower relative humidity. In greenhouses with fans, the fans should be activated and operated for a few minutes and then the heater turned on to bring the air temperature up. The fans should then be shut off. A clock could be set to activate the fans. A relay may be needed to lock out the furnace or boiler until the fans shut off so that both the fans and heating system do not operate at the same time and result in flue gases being drawn into the greenhouse. Air movement, even in a closed greenhouse, helps reduce moisture on plant surfaces and in the microclimates around plants. A fan-jet or horizontal air flow system produces uniform temperatures and reduces the cool spots that can develop condensation problems. Air that is moving is continually mixed; resulting in very small temperature differences. The moisture does not get a chance to condense on the leaf surfaces because the mixing action caused by air movement prevents the air along the surface from cooling and causing condensation. This results in less Botrytis infection and development. In addition to reducing the humidity and keeping foliage dry, the source of Botrytis infection needs to be reduced. Botrytis spores are produced in abundance on senescing flowers and flower petals, lesions, and plant debris left behind during harvest, the greenhouse floor and in trash cans. Controlling weeds and removing plant debris during production and harvest helps to eliminate Botrytis. Regularly remove spent flowers and dying or dead leaves from plants and the soil surface and eliminate them from the greenhouse and field. Dispose of debris in plastic trash bags and avoid spreading spores by keeping the bag closed while moving it through the greenhouse or field. Be sure cull piles are not located near greenhouses or cut flower fields where spores can re-infect plants. Although this is labor intensive, it will help reduce spreading spores. Make sure trash cans are sealed tightly in the greenhouse as open trash cans are a reservoir for sporulating Botrytis. Carry your sanitation program into post harvest handling. Clean and sanitize coolers and cool rooms. To prevent Botrytis infections on flowers, foliage and buds during shipping, avoid packing moist flowers and foliage after harvest. To prevent condensation of water droplets on flowers or foliage, avoid moving flowers directly from cool to warm rooms. A number of fungicides are labeled for use against Botrytis on ornamental crops during production. When making a fungicide treatment, treat thoroughly, reaching into the canopy area. For management, growers often rely on fenhexamid (Decree) which is a non-systemic fungicide with both protective and curative activity, chlorothalonil (Daconil) or iprodione (Sextant, 26 GT). Botrytis strains have reportedly shown resistance to Sextant and 26 GT, although not widespread, so rotate these with other products to delay resistance. There are reports of widespread resistance to the benzimidazole fungicides (Cleary's 3336 and Fungo Flo) and therefore are no longer suggested as a primary fungicide for Botrytis. In addition to fungicides for production, there are also fungicides labeled for some flowers for post-harvest use. The copper-based product Phyton 27 and the biofungicide Rhapsody (QST 713 Strain Bacillus subtillus) are both labeled as a post-harvest dip for flowers and buds to prevent Botrytis. Hausbeck Mary. Does botrytis have you feeling too warm and fuzzy? Greenhouse Alert Newsletter, Michigan State University. 2007. Dole J.M. and M.A. Schnelle. The Care and Handling of Cut Flowers, Oklahoma Cooperative Extension Service, Fact Sheet F-6426. Stack L.B. New England Greenhouse Floriculture Guide, A Management Guide for Insects, Diseases, Weeds and Growth Regulators. New England Floriculture Inc.